1957 reprint. No dust jacket. This book is from our pre ISBN stock and is therefore over 50 years old. It has a general appearance commensurate with its age including age effects to page edges, binding and boards. This book is from our pre ISBN stock and could therefore be over 50 years old. It will have a general appearance commensurate with its age including age effects to page edges, binding and boards. Dust jacket is absent unless otherwise stated Usual signs of a well read book but good ov. One of my All Time Favorite Books!!!! This is a delightful and heartwarming story that takes place right after World War I, in England and Scotland. The storyline centers on Lassie, the Carraclough's pet Collie. The family loves their dog very much... but when hard times hit, the family is forced into making a life-changing and heart-wrenching decision. The town of Greenall Bridge could always depend on seeing Lassie trotting down the streets with her owner, young Joe Carraclough. As the story unfolds, you will discover how determined and loyal that a dog can really be. Through the experiences of Lassie, you will meet many of the villagers, some with thoughtful regards, and some characters with bad intentions. No matter what kind of situation, someone is always there to guide Lassie on her way. This book was originally published by Eric Knight in 1940. Only 3 years later, the author died. However, the classic story of Lassie has been told again & again since then, in other revised & adapted books, and also in movies. I think almost anyone would enjoy this story. The dedication and perseverance of the dog, to the quaint villages of England and Scotland, and all the characters within, along with their lovely British accents... I savored every word! I first read this story in the fourth grade. I have also seen the movie. The book is definitely animal lovers will love to read as they see Lassie make the long journey to be with his master. There are sad and happy moments in the story and you'll not want to put this book down until you're finished. 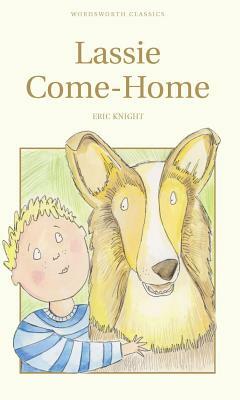 This book is a classic with a happy ending that all dog lovers will enjoy.